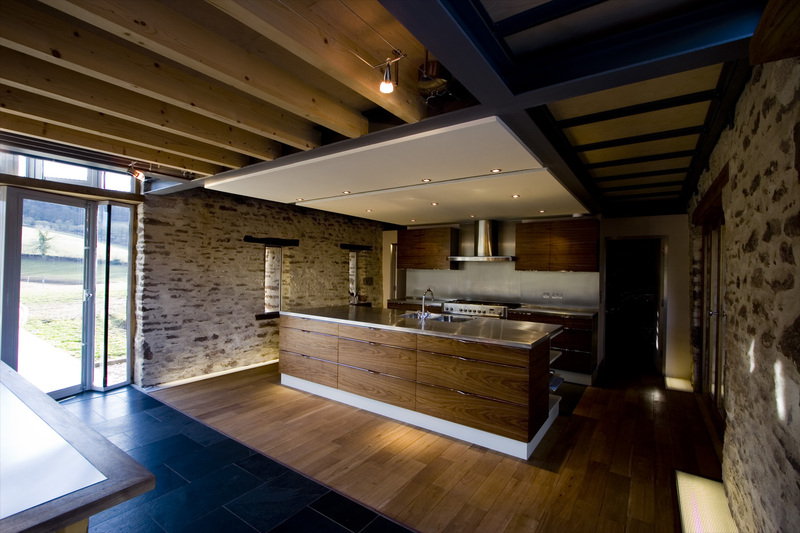 This old threshing barn, located in the Forest of Dene near Ross on Wye was converted by the client as a self build project. 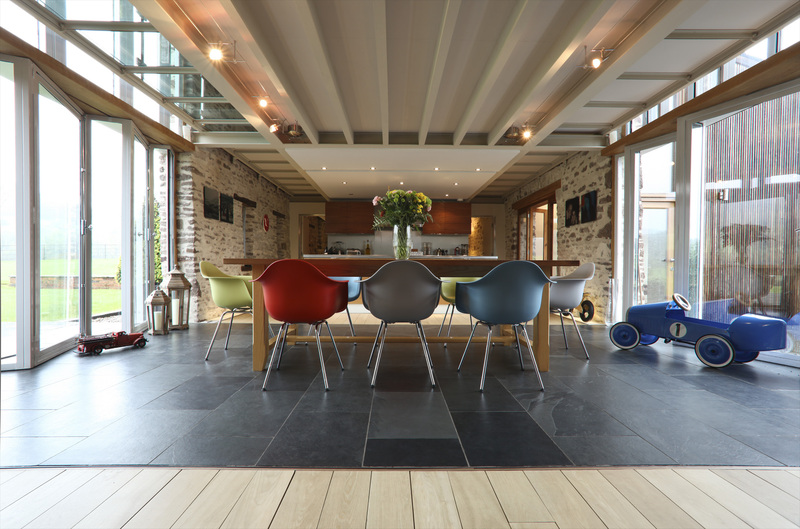 The client was interested in bringing about a modern take on a typical barn conversion, and as they were furniture designers themselves, they were also interested in presenting the project on Grand Designs. 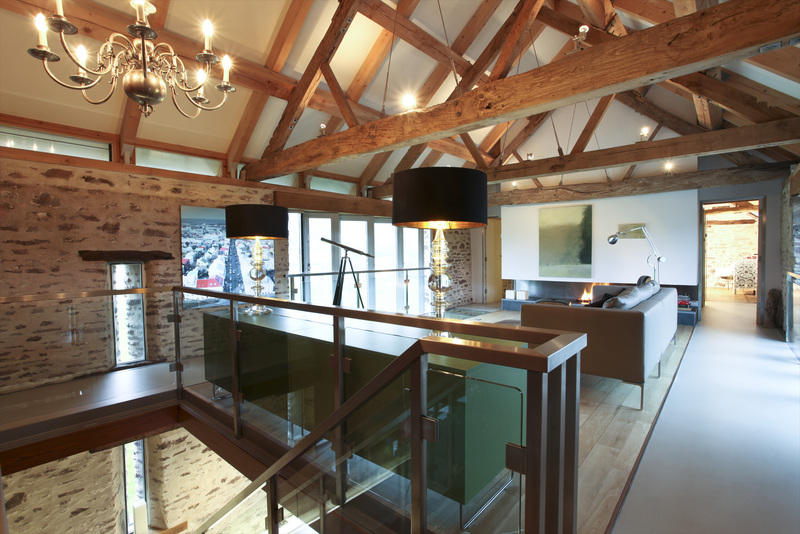 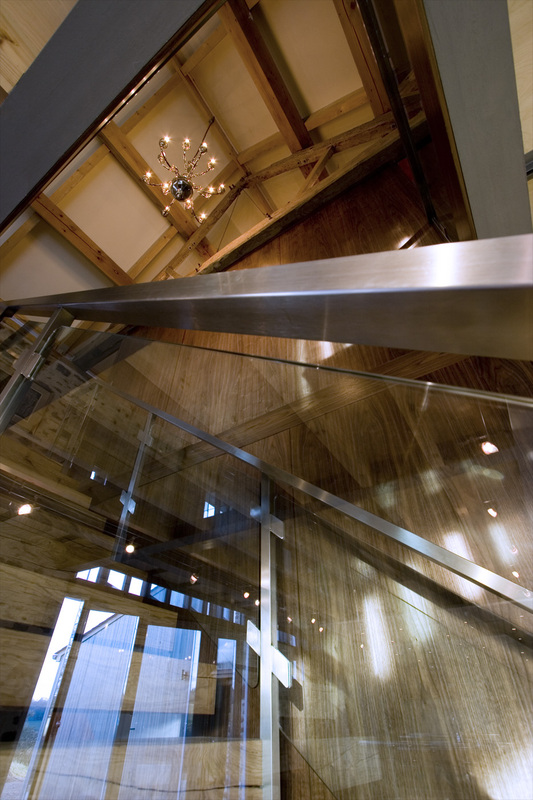 The barn conversion was filmed by Kevin McCloud, as a contemporary barn conversion, and this project was judged the all-time top-25 Grand Design and was presented at the Montrose film festival during the year the programme was first broadcast on Channel Four. 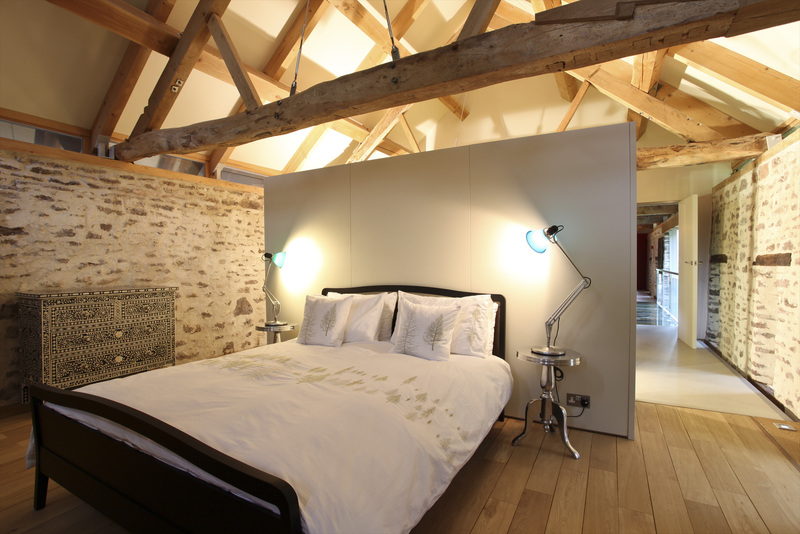 Kevin McCloud was interested in celebrating this old stone structure as well as capturing a high quality contemporary barn conversion. 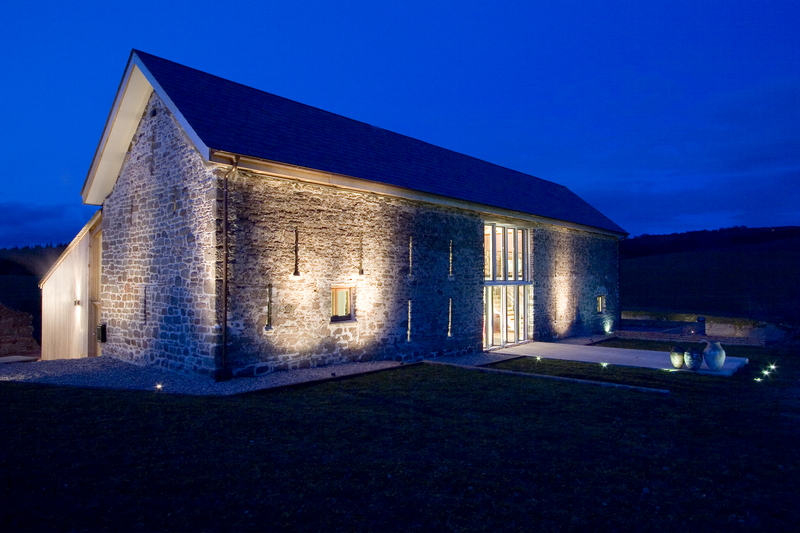 The project focused on how light could be brought into the interior spaces and how the quality of the old barn could be maintained. 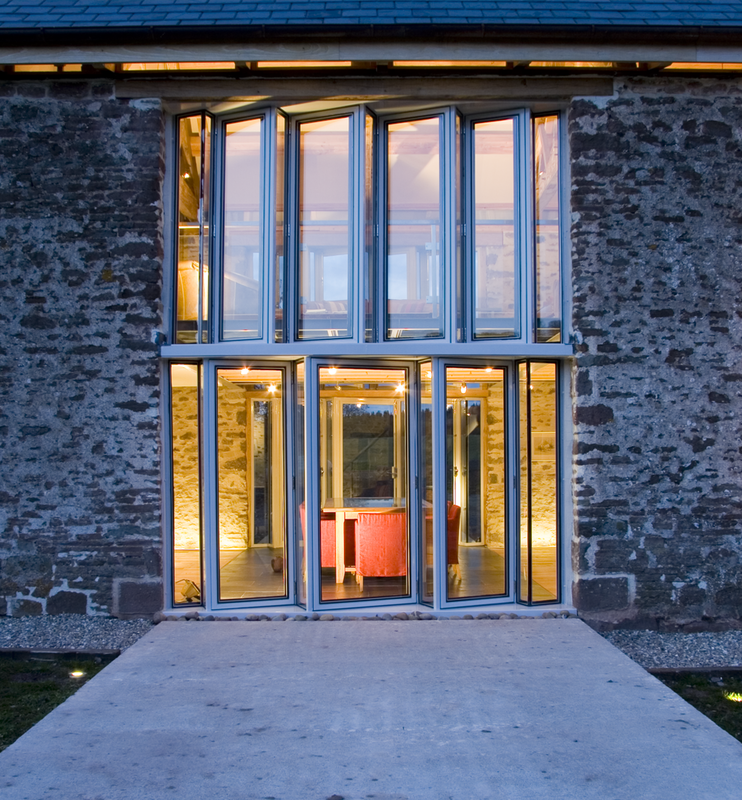 The design for the barn focused on placing light dependent uses around the centre of the plan, where daylight is maximized, and less light dependent uses, such as the TV room and bedrooms, are placed towards the ends of the barn, where daylight was limited. 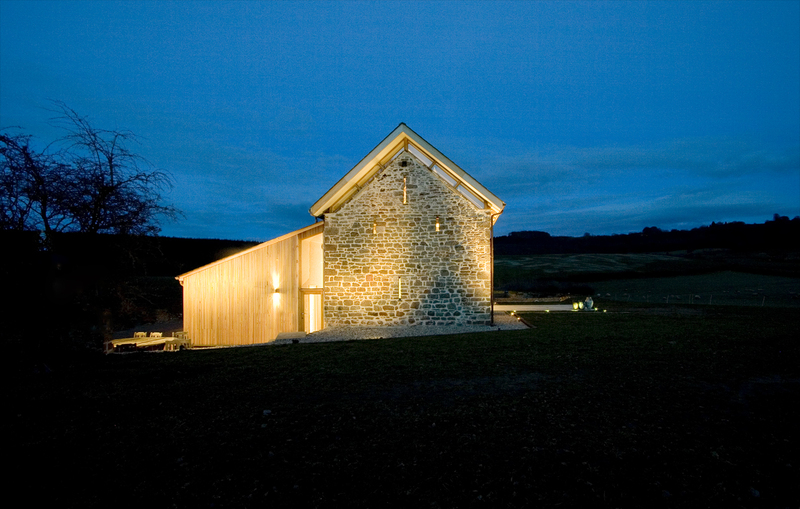 This arrangement around light source was because the stone walls of the threshing barn have narrow arrow-slit windows, which provide natural ventilation and limited daylight to protect stored wheat, and in the centre of the plan there are two large opposing openings to formed to generate wind to facilitate the threshing of wheat. 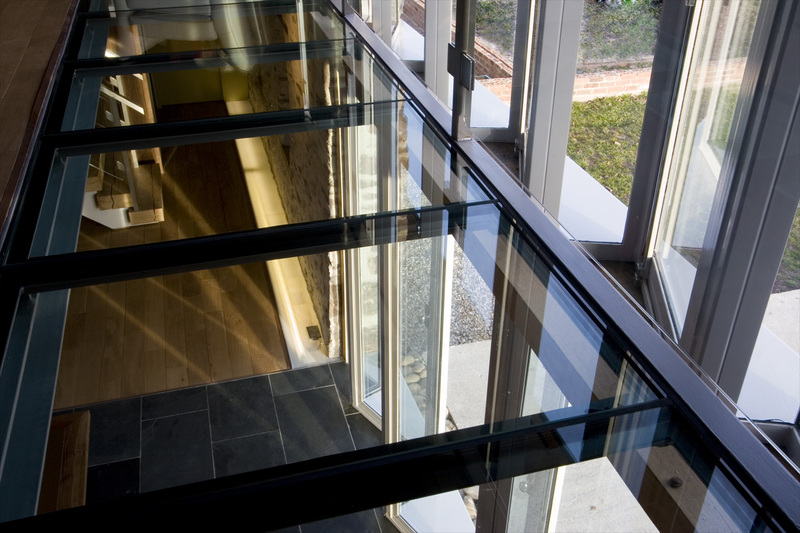 The first floor deck was created in steel by Thomas Forge. 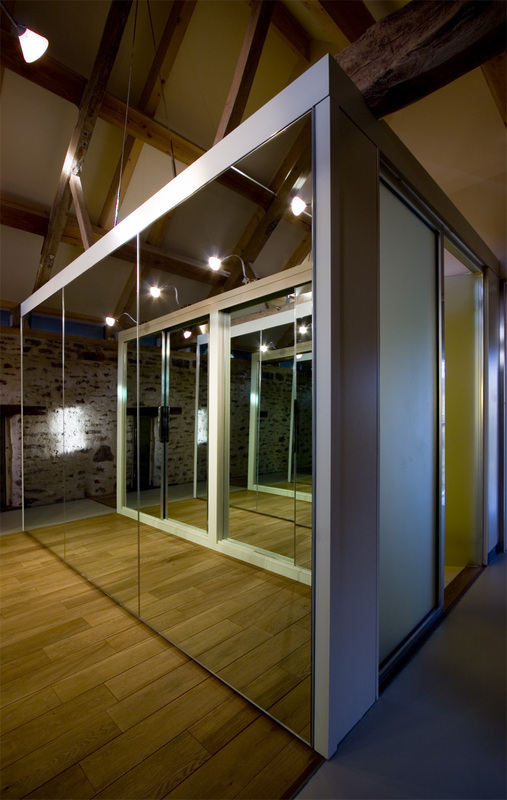 ‘I come from a long line of blacksmiths and farriers and it was important to me to bring precision engineering to this project, to capture a sharp contrast against a wonky age old interior.’ Said architect Garry Thomas describing the scheme. 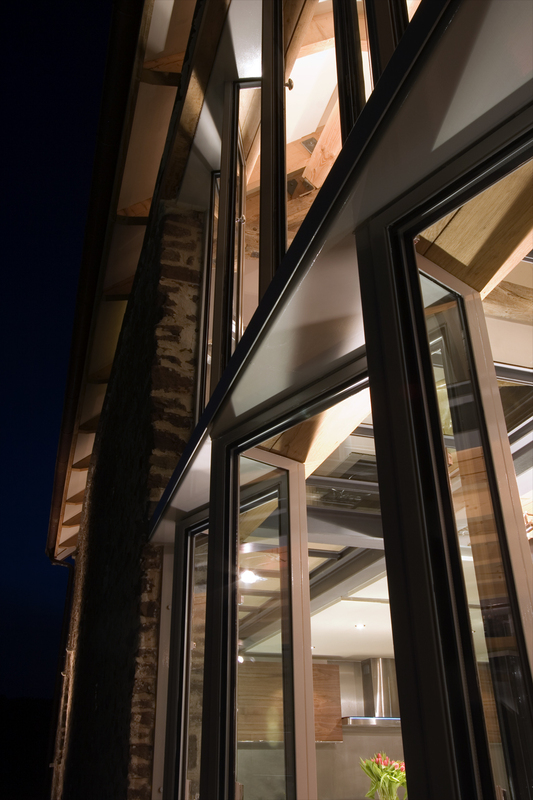 The other ingenious design feature that used within the design was to elevate the roof at eaves level to introduce more daylight and ventilation around the entire barn. 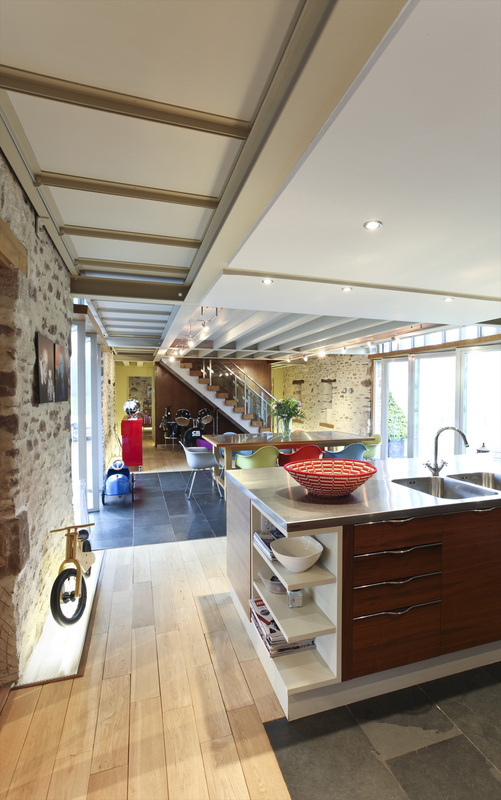 This allowed the barn roof to appear to float over the interior spaces as if by magic, it also reduced the need to form new openings in the old stone walls. 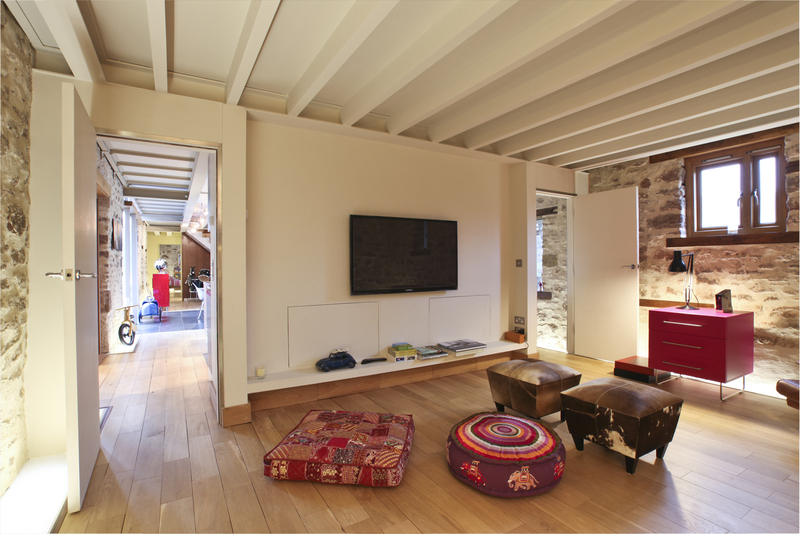 You can still catch up on this Grand Design episode, as it is often re-shown on More 4.